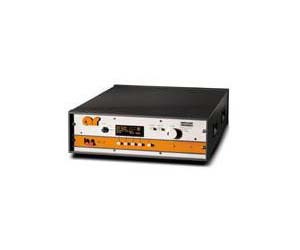 The Model 40T18G26A is a self contained, forced air cooled, broadband traveling wave tube (TWT) microwave amplifier designed for applications where wide instantaneous bandwidth, high gain and moderate power output are required. A reliable TWT provides a conservative 40 watts minimum at the amplifier output connector. Stated power specifications are at the fundamental frequency. The amplifier'''s front panel digital display shows forward and reflected output plus extensive system status information accessed through a series of menus via soft keys. Status indicators include power on, warm-up, standby, operate, faults, excess reflected power warning and remote. Standard features include a built-in IEEE-488 (GPIB) interface, 0dBm input, VSWR protection, gain control, RF output sample port, plus monitoring of TWT helix current, cathode voltage, collector voltage, heater current, heater voltage, baseplate temperature and cabinet temperature. Modular design of the power supply and RF components allow for easy access and repair. Use of a switching mode power supply results in significant weight reduction. Housed in a stylish contemporary cabinet, the unit is designed for benchtop use but can be removed from the cabinet for rack mounting. The Model 40T18G26A provides readily available RF power for a variety of applications in Test and Measurement, (including EMC RF susceptibility testing), Industrial and University Research and Development, and Service applications. These sub-octave amplifiers feature moderate harmonic content.